Feeling tired and sleepy in the afternoon? Well, that’s completely normal, but it doesn’t mean that you should let the afternoon slump control your day, instead, do something and make your afternoon a bliss. 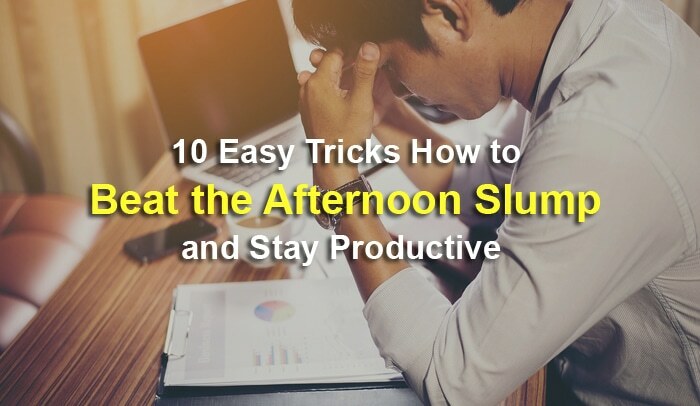 Most of us are productive and motivated in the morning, but when it comes to the afternoon, we’re often hit by the slump that makes us feel unproductive and has no motivation to do things. The circadian rhythms affect your sleep patterns and are also a factor responsible for your afternoon slump. Besides that, your energy plummeted as you work throughout the day. It works like your phone. In the morning, your phone is fully charged. And as you go through the day, you work, move around, think, etc, you use up some of your energy. And by the midday, usually, you’re tired of working for long hours. You feel sleepy after your lunch too. So if you want to beat your afternoon slump and stay motivated throughout the day, you will have to learn how to control your energy. Here are 10 easy tricks of what you can do to maintain your energy level, to stay productive, and to get rid of your midday slump. First, take a short break. Plenty of studies have discovered that over-learning or over-working can lower your productivity. People who spend long hours working will find that their productivity decreases over time. And for students to read and learn for long hours, a similar pattern was shown. Thus, you have to take breaks from time to time. You simply can’t focus on a certain project or task for 10 hours straight. You’ll burn out and your brain will be overwhelmed and your productivity will be lowered. This is why time management technique like the Pomodoro Technique works great. After you take a short break from your work, you feel refresh. You give your mind a breather and the short break recharges your energy and creativity too. Walk around, talk to your colleagues, get a drink, take your mind completely off the task, and do something else. Whatever you do, walk away from your task. 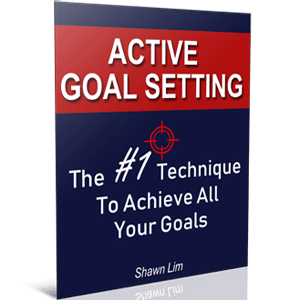 You want to get a pitstop to replenish your energy and boost your productivity. This is easy to understand. When you take in a heavy lunch, your body needs to work more to digest the food. And when your body requires more energy to digest all the foods that you poured into your mouth, guess what will happen to your energy level? After eating, your body releases hormones such as amylin, glucagon, and cholecystokinin, which increase your blood sugar levels, causing you to feel sleepy. It also depends on what kind of food you put into your body too. Some foods that are rich in protein like cheese, meat, poultry, and soybeans can cause your body to produce serotonin that makes you feel drowsy. So watch what you eat for lunch. Imagine sitting on your chair and looking at the screen for hours, think you won’t feel tired? A midday trip to the gym can boost your productivity and also prevent the afternoon slump. Now, if you don’t want to get sweat all over, do some simple exercise and stretching. First, step away from the screen. And then stretch out to keep your muscles loose. If you have no idea what kind of stretches you should do, check out this article from Greatist. When you stretch, move around, and exercise, you increase your blood and oxygen flow to your brain. This makes you feel refresh and also improves your alertness at the same time. According to this article from BBC, British workers lose 24 minutes a day getting tea and coffee. And getting traditional tea and coffee run has become an office ritual where 4 out of 10 workers make a hot drink for more than one colleague every day. So if you’re the boss, you might worry that your staff wasted too much time on tea breaks. But worry not, because scientists have discovered that tea breaks aren’t a waste of time, instead, they improve mood and make people more creative and productive. Tea and coffee contain caffeine and theanine that can cause relaxation and alertness. Plus, people actually enjoy making tea and coffee, the taste, and the aroma of their drinks. Like eating sweets, tea breaks can make you happier than drinking plain water. “These findings appear to confirm what many of us suspect; that the close to sacred ritual of the tea break can effectively boost your mood, which in turn can lead to other benefits such as improved problem solving,” said lead scientist Suzanne Einother on DailyMail. Hence, whenever you’re feeling tired, stop your work and go for a tea break. When you’re at your peak, you should spend your time and energy on the most difficult and important task. For instance, I spend my morning on writings. I know that in the morning, I’m the freshest and thus, I use my mornings to create articles such as this one. Writing requires creativity. And don’t want to waste my energy and creativity on things that require none of them. And in the afternoon, usually, I will work on things that require less of my creativity and brain power. I will work on things like updating social media accounts, creating quotes, schedule social media posts, etc. You should do the same. If you are always hit by midday slump, then you should consider scheduling tasks that take less creative and brain power to work on. Choose to work on the more heavy and creative work in the morning when you’re fresh. Another approach suggested by Reader’s Digest is to work on a project that you’re enthusiastic about in the afternoon. In the morning, work on your most dreading task. And in the afternoon, spend your time on tasks that you love to do. Let your passion conquer your afternoon slump. So test it out. Understand your rhythm and schedule your work so that you can get the most out of your afternoon. Another great method to beat your midday slump is to change your workstation. When you introduce variety into your daily routine, you make your work fresh. For example, if you sit and work in front of your computer most of the time, try to change your workstation. You can use the laptop on a standing table, work in a nearby coffee shop, or just switch places with your colleagues. The key is to introduce “newness” to your brain. You want to get rid of the routine that your mind think it’s boring. Try to brush your teeth with a different hand in the morning. If you use your right hand to brush your teeth every day, try to do it with your left-hand tomorrow. And see how that makes you feel. When you’re doing something different and something new, your mind will be more alert because you’re not used to it. This is why changing your work environment can help conquer your afternoon slump. Switching to another task works too. Like what I mentioned above, when you do something different, you inject freshness to your brain. And this makes you awake and you won’t feel sleepy. When you focus on doing one task for long hours, you wear down the part where you use brain. For instance, when you do your accounting work for hours, another part of your brain may crave for attention. Doing calculation uses your left brain. And when you put too much attention on your left brain, your right brain wants some attention too. This is when you will lose your focus and often gets distracted by other thoughts. And if you press on to concentrate on the work, it makes you feel tired and sleepy. Therefore, switch your task. Don’t focus on doing just one type of work for long hours. Make your life fun by introducing options and variety. Taking a power nap in the afternoon is one of my favorite ways to beat afternoon slump. It is simple. You feel tired and sleepy, your brain tells you to sleep, and you sleep. However, not for an hour or two. A power nap is meant to be short, like from 15 to 30 minutes. This is to prevent you from falling into the deep sleep mode that will make you feel even more tired when you wake up. Taking a power nap doesn’t just increases your productivity and alertness, it also boosts your memory, improves your heart health, and elevates your mood. President John F. Kennedy ate his lunch in bed and then settled in for a nap – every day. So what about you? Are you going to get a power nap when you’re tired and sleepy? Do you know that melodious sounds help encourage the release of dopamine in the brain? It is difficult to control our thoughts especially when we’re tired and sleepy. And music can help bring us back to the present moment. Teresa Lesiuk from the University of Miami found that people who listened to music completed their tasks more quickly and came up with better ideas than those who didn’t because music improved their mood. It is common sense that music can change our mood. So when you’re feeling tired and sleepy, try to put on some uplifting and fast-paced background music, it will wake you up and get you motivated once again. Most of the time, I write articles with some background music. And when I’m doing work that requires less thinking, I will play songs with lyrics. This is how I maintain my productivity and beat the midday slump. This is a quick way to make yourself wide awake – splash cold water on your face. When you’re feeling tired and sleepy in the afternoon, or even in the morning, this quick fix is effective. When the afternoon crash comes, get up, go to the pantry or the bathroom, and wash your face. You can also use a towel to do this. Hence, use this trick to make you awake in the midday. It is normal to feel tired and sleepy in the afternoon, especially after lunch. But you can reboot your mood and make yourself awake again using the 10 methods above. You don’t have to always make your afternoon unproductive. Try out these tips and let me know how they work on your side. Do share your experience in the comment section below.